This is a great catch, but Pixel I/O rightly acknowledged that The Jetsons was not a film, so off by a technicality. Shouts out anyway, as this example was a full three or four years before the film I did have in mind, which was the only-nominally sci-fi comedy The Glass Bottom Boat (1966). Still, I happened to come across it in research and captured it. In the film, the inventor Rod (Bruce Templeton) tries to impress Jennifer (Doris Day) with this floor-cleaning robot. It only manages to pop out of its door to arc towards a dropped banana peel and through reversed footage, arc right back into its home under the kitchen island. What’s interesting about these two examples are their similarity. They’re each the size of a small dog. Each has an antenna and two eyes. The antennae speak of the radio-controlled paradigm of the era. Audiences needed to know how they are being controlled, and this shortcut answered the question at a glance. The eyes hint at a need for anthropomorphism, or possibly zoomorphism, for users to understand the thing’s capabilities. We know it can see us and the things around it because of this simple visual affordance. 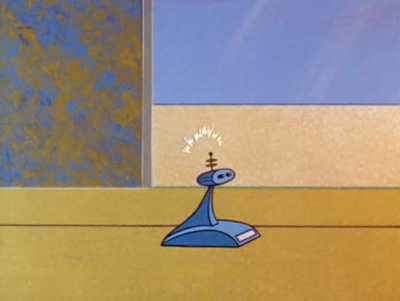 This entry was posted in The Glass Bottom Boat (1966), The Jetsons (1962) and tagged anthropomophism, automatic, autonomous, chore, cleaning, context aware, eyes, housework, kitchen, robot, smart home, sweeping. Bookmark the permalink.